Finally, the landing gear hit the tarmac after a long day of travelling. My flight out of Akron, Ohio went by fast enough, but a long layover in Denver International Airport left me anxious to get the remaining five hours of air time out of the way. When I landed in Anchorage, the sun had long since set. The airport seemed like any other does by night: rows of flashing lights guiding planes in to safe and hopefully smooth landings. The ride in the hotel shuttle was equally uneventful, with the city seeming ordinary against the black backdrop of the night. I knew better than to assume nothing lay beyond the city limits, yet it was hard to fully imagine what my eyes would be presented with that following morning. As I stepped outside Saturday morning I had my first look at Anchorage. Beyond the buildings and bustling streets were towering mountains and Pacific waters. My trip had officially begun. Over the next few days I would see why I was right not to try and imagine the landscape that was hidden by the night’s darkness when I landed. My trip to Alaska was spurred by my research. In just under a week after my arrival, I would be presenting the current status of my work at this year’s Association of Environmental & Engineering Geologists (AEG) National Meeting. By arriving several days before the conference even started, I not only gave myself more time to fret about refining my powerpoint and deciding on what I was going to say, but allowed myself time to get out and explore some – if only a fraction – of America’s largest state. 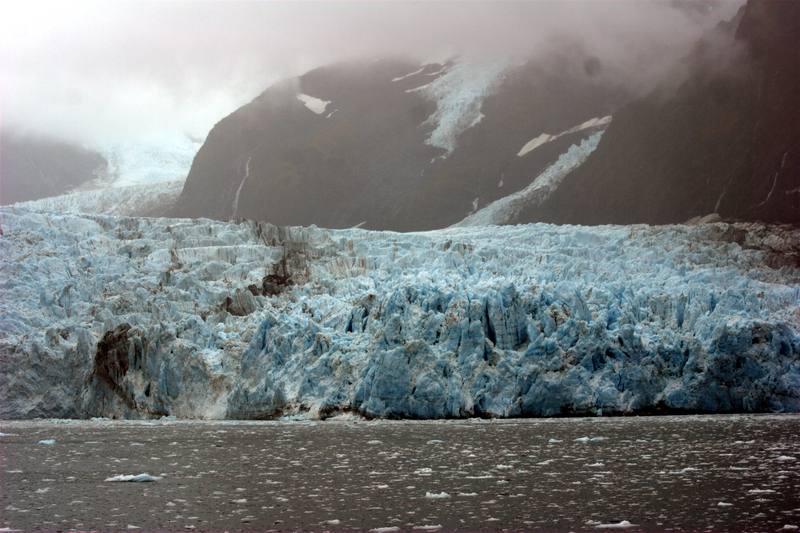 Today I would attend a field trip planned through the AEG National Meeting on which I and about 50 other meeting attendees would ride a train to Whittier, where we’d then hop on a boat to view the wildlife, scenery, and glaciers that populate several of the fjords in Prince William Sound. On the down side, it was overcast and raining almost the entire time. On the up side, the trip was a blast, the rain let up for a while, and the glaciers were so blue it looked as if the cruise companies pay good money to have the them spray painted in an effort to keep tourists coming. 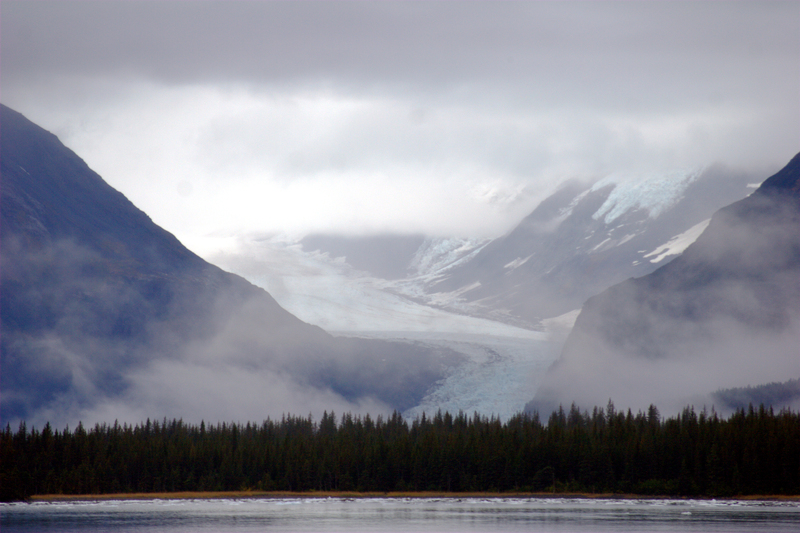 Lucky for us, the blue color of the glaciers is accentuated during cloudy days…so believe it or not, the pictures you are seeing are not doctored up. Why does this happen? It’s all due to the absorption and scattering of light. Ice – like water – absorbs shorter wavelengths of light (the red end of the visible spectrum) while reflecting and transmitting longer wavelengths (blue end of visible spectrum). The longer the path that light takes and more scattering before it reaches your eyes, the more blue the glaciers will appear. On cloudy days, the light is already being scattered through the cloud before even reaching the snow and ice…this extra step results in more blue! What was even more astonishing was the sheer size of these “rivers of ice”. Harriman glacier, for example, is a mile across at the water (and easily over 100 feet tall). Pretty big. With nothing for scale but rock, water, and more ice, it was hard to comprehend the size of the glacier even though it lay right before me. A later measurement on a map revealed the tour guide wasn’t exaggerating. On day two, a few of us took a rental car from Anchorage to south Seward. 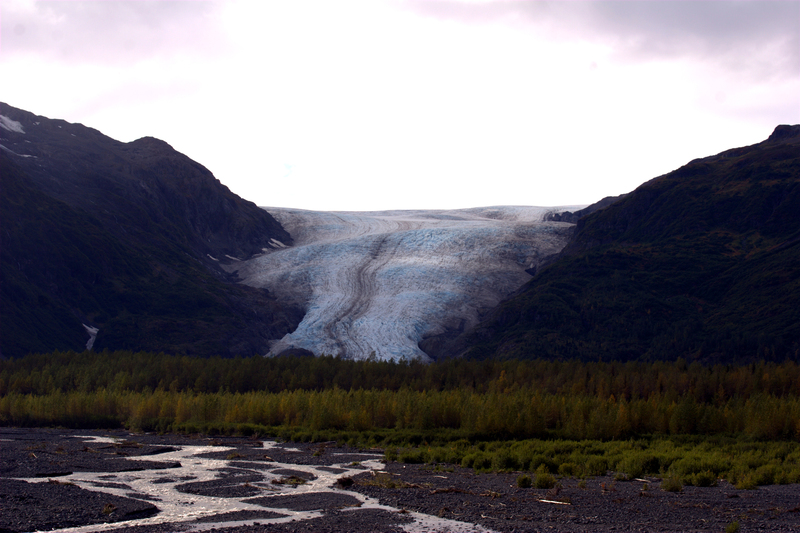 During the trip, we visited Exit Glacier only eight miles outside the town and the only glacier in Kenai Fjords National Park to which you can hike. 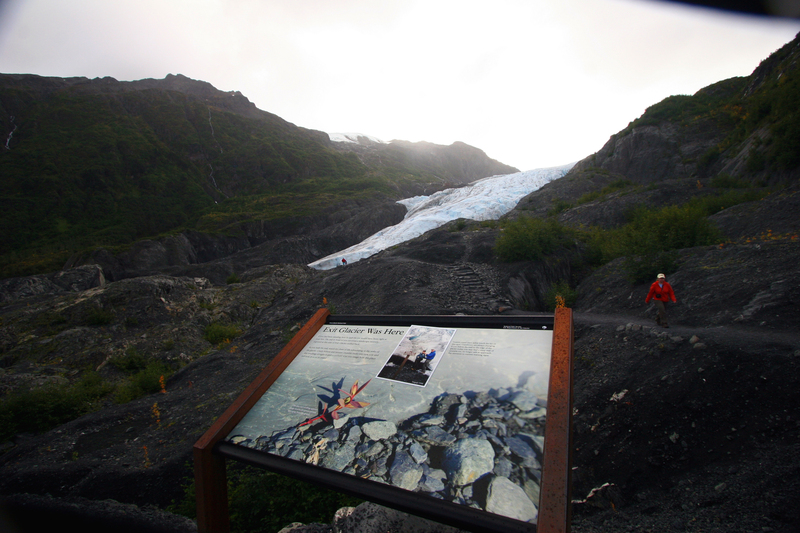 Unlike what the brochures made it sound like, you can no longer touch the glacier from the trail. After speaking with the park ranger at the head of the trail, we found that it’s been about 10 years since the trail actually went right up against the glacier itself (evidence of the glacier’s retreat back up to the Harding Icefield). However, it’s still near enough to throw a rock at and well worth the mile hike to the “Edge of the Glacier” where you can not only get a very close up appreciation for glaciers, but see some amazing views of the surrounding Kenai Mountains. 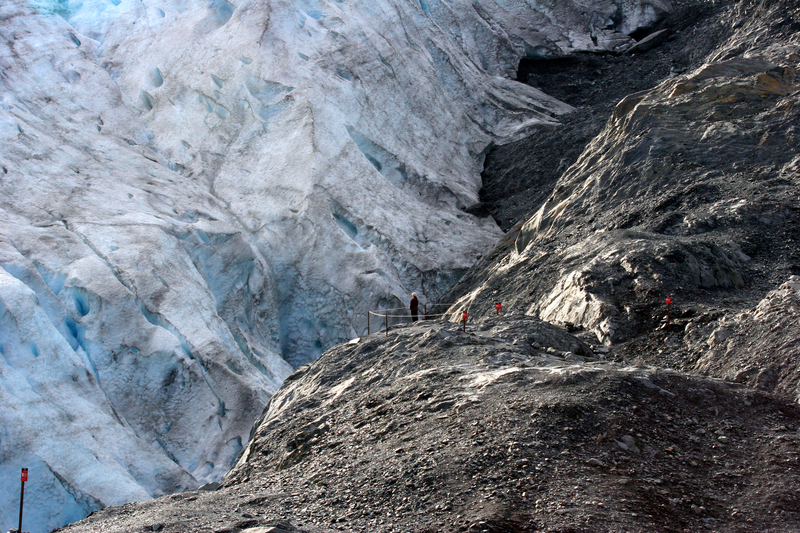 A woman stands at the end of Exit Glacier’s “Edge of the Glacier” trail. A sign marks the location of Exit Glacier in 1998. Monday was Denali Day. The drive there was long. Especially when a good two hours of it were through relatively flat landscapes where the only things to see were trees. Yet, the changing colors of the leaves made the drive go by fast…even with the numerous stops to take photos. Many of the peaks of the Alaska Range were quite visible along the way (see below). To my dismay, North America’s highest peak – Mt. 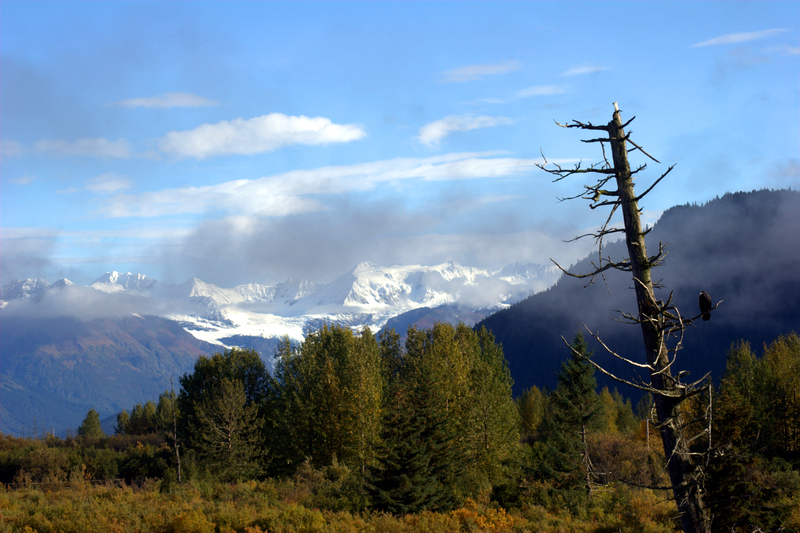 McKinley – decided to remain elusive behind a cloak of clouds. At over 20,000 feet (6,194 m) above sea level, McKinley (often referred to by its native name “Denali”), is one of the tallest mountains in the world, coming in a little less than 9,000 feet under Mt. Everest (the world’s highest peak). When measured from base to peak, however, McKinley is actually taller than Everest by 3-4 thousand feet! 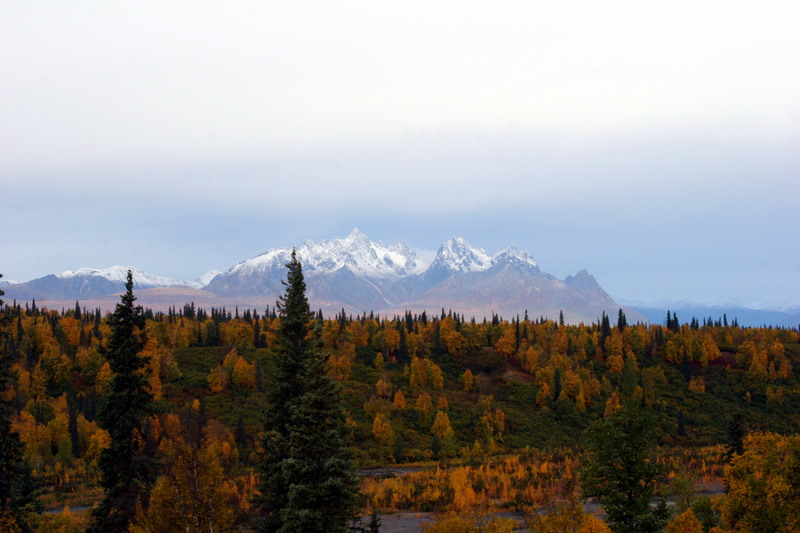 I’m pretty sure we were able to get a glimpse of part of the mountain…but a return trip to Denali N.P. is warranted in order to finally see this natural wonder. With the rental car due back by that evening, we ended our exploration of Alaska – or rather, a mere sliver of the state – and returned to Anchorage and the conference for which we came. The rest of the week went great with many very good presentations and events. Lots of fun and learning! My presentation went well on Friday (at least I felt that it did) and the week was over seemingly right after it had begun. After one more long day of travelling, I returned home to write this post…well, maybe I took a week off in between. In attempting to keep this post fairly short, I left out what most of my days of exploring were all about: the drive. The scenery that you pass on the way to any one place is as much a part of the adventure as actually making it to your destination. 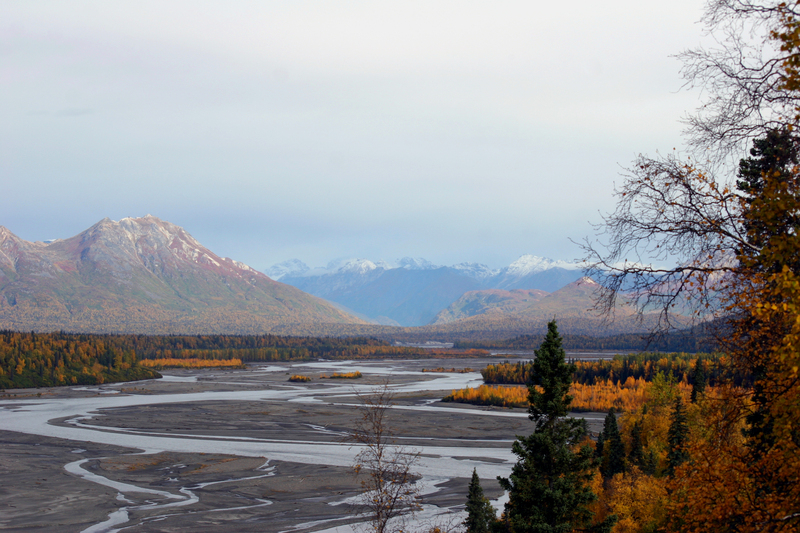 Wide open fields, dense forests, tall mountains covered in ice and glaciers, huge glacial valleys, braided streams over the gravelly outwash plains, the tidal waters of Turnagain Arm, wildlife…I feel as if this list could go on forever. That’s to say nothing of all the great exposures of the area’s rich geologic history. The southern boarders of Alaska are some of the most tectonically active locales on Earth. A great blend of ancient processes preserved in the region’s geology, superposed by the modern structures and deposits created by the same processes. During our days in the rental car, we easily added hours to our drives due entirely to our “picture stops.” Thanks to these short breaks from driving, I returned from Alaska with well over 1,000 photos from my first three days alone. If you ever get a chance to visit Alaska, make sure you give yourself plenty of travelling time…you won’t regret it.